And this is not doll related, so consider yourself forewarned. This blog entry is a personal rant on the insidious and, in my opinion, fraudulent ongoing theft of products from the pantries, shelves, linen closets, and freezers of honest Americans. This crime is being perpetrated by manufacturers and companies who must believe that most Americans are too oblivious to notice or too apathetic to speak out. Well, I think it’s time Americans spoke out! So, here is my rant of the day…my soapbox diatribe…I’m sick and tired of having my favorite products downsized while the price remains the same as it ever was (I’m hearing The Talking Heads in my mind now. LOL) or actually goes up a few cents! Meanwhile, the manufacturers are touting the fact that they haven’t raised prices or if they’ve raised prices, it has been by a miniscule amount. OH, REALLY?? If I’m paying the same amount for LESS product, isn’t that the same as raising the price? Let me check with my resident rocket scientist….uh, YES, it is! Case in point: We like a certain brand of toilet paper. Hubby just compared two rolls of said brand, one roll from an older package and one roll from a newer package. Both multi-roll packs cost had the same price. Both came from the same store. The new roll is 22% lighter by weight. New roll is 1/2″ narrower in width. New roll is 1/8″ narrower in diameter. 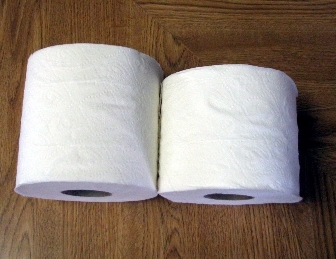 Held side by side, the two rolls are obviously much different in size. No rocket science needed. Another case in point: Hubby’s favorite brand of ice cream…same price, SMALLER carton. Again, no rocket science needed. I KNOW of which toilet paper you speak!! When I noticed the same “pull-one-over-on-me”, I emailed the company. Their response?…..they sent me a coupon for their NEW higher-end “premium” product. Okkkkkkaaaaaay. So I used the coupon, only to find out that this new product, in addition to being more expensive, is on steroids! It’s “ultraplush” and 3-ply! Now, lol, we had to invest in a plunger– you still have to use the same number of squares for “coverage”, but the stuff is so thick, it clogs our toilets! I am on the prowl for a new brand. The only thing I would not mind companies making smaller for the same price would be chain restaurant meals. They are so much bigger than they need to be. Hmmmm, I won’t even go there on how this might link to smaller toilet paper.